Jonathan Tropper's new novel, One Last Thing Before I Go, is like that sad, too-self-deprecating friend everyone has, who, despite the fact that he depresses you to no end, you still hang out with him because he's entertaining as hell. It's a bit of a departure from Tropper's first five novels — which are usually crackling with one-liners and populated by dudes getting wantonly laid without trying too hard. Indeed, One Last Thing Before I Go is Tropper's most melancholic novel. While still often funny and with much of Tropper's signature dude-humor, its main goal really seems to be to explore how badly beaten you have to be to decide you'd rather not live anymore. That's the decision our protagonist, 44-year-old Silver, makes. Silver, a former drummer in a one-hit-wonder rock band called The Bent Daisies, has been divorced for seven years, and his ex-wife is about to marry a rich, handsome doctor. Also, his 18-year-old daughter Casey is pregnant, and only decides to tell Silver because she's not-at-all worried about letting him down. So when Silver winds up in the hospital with a rare heart condition — which a simple surgery will solve — Silver declines to be operated on, deciding instead to put his affairs in order as best he can, and wait for death's call. But something odd happens on the way to the grave. "Silver doesn't really know how to explain it. It's like he's been inexpertly rewired. Signals are being mixed, relays being tripped, power surging and waning, and he's acting on impulses before he knows he has them." When you've got nothing to lose, you live your life like losing doesn't matter. And so the rest of the novel follows Silver around as he speaks his mind (sometimes when he doesn't even realize he's talking out loud) and tries to make amends to his wounded family. Will he be able to rescue himself from his family's ire? Will he screw things up worse than they already are? Will he finally decide to have the surgery that'll save his life? But One Last Thing Before I Go strays into the cliché a few too many times to elevate it into the top tier of Tropper novels. There's actually a scene where Silver grabs a microphone at a Bat Mitzvah and professes his apologies and love for his daughter in front of all the guests. You could almost feel a John Hughes "slow-clap" coming on. And all the divorced dudes live in a converted hotel called The Versailles, which is reminiscent of "Casa Nova: A Transitional Place for Singles" from The Simpsons. There's others, too, which I can't tell you about without spoiling. Still, only-okay Tropper is great reading. So four stars. "Stories are people. I'm a story, you're a story ... your father is a story. Our stories go in every direction, but sometimes, if we're lucky, our stories join into one, and for a while, we're less alone." That's just a wonderful notion, both of fiction and of real life, isn't it? So in this novel, we jump back and forth in time, from a small and dying fishing town on the Italian coast in 1962 to modern Hollywood to 1970s Seattle and even to modern London. Snippets of story connect a cast of characters, who are all, themselves, connected in ways they may not be aware of, or may not want to admit. During the shooting of the movie Cleopatra in Rome in 1962, Richard Burton and Liz Taylor carry on a torrid love affair. And it's the responsibility of one Michael Deane, a young producer, to make sure the over-budget beast of a movie gets back on track. Pasquale, a young 20s Italian, is entranced with a beautiful American actress named Dee who almost literally washes up on the shore of his small village. And then, in modern times, late 20s Claire, armed with fancy film degrees and working for a now 70-something Deane, struggles with the age-old question of good film vs. popular dreck. In addition to the fascinating stories of these characters, and the even more fascinating ways they connect, we even get snippets of Deane's biography, a first chapter of a novel by a failed writer who vacations at Pasquale's Italian hotel, and an entire pitch for a film called Donner! by another failed writer hoping for one last chance at stardom. Normally, this kind of almost gimmicky storytelling is kind of annoying — you just want the writer to get on with the story, not distract us with these sideshows. But not here. Each of these DeLillo-like strains actually enhances the core story — giving an indication of how the connections will come to pass. And when they do — at the emotional conclusion — you're left in awe. The only bad thing I'll say about this novel is that the title isn't exactly catchy. Even with the striking cover image, the title's just a bit too precious — a silly oxymoron that more turns you away instead of brings you in. But by way of explanation: "Beautiful Ruins" is derived from a 2010 New Yorker article about Richard Burton — "Burton, fifty-four at the time, and already a beautiful ruin, was mesmerizing." This is one of three quotes that make up the novel's epigraph. With Beautiful Ruins, Walter again expands his scope — he's done crime drama, 9/11, and pseudo-dude lit. This is possibly his most "literary" novel — whatever that means. It's not my favorite novel of his — that's still a tie between The Zero and The Financial Lives of the Poets. But this is still a stunningly good read. Four stars - highly recommended. 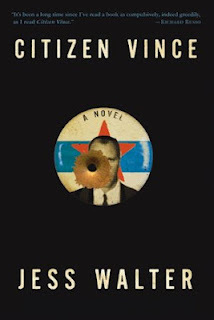 Given the state of the national political discourse these days, I wonder if Jess Walter regrets using politics as a sort of metaphor for a normal life, as he does in his fantastic 2006 novel, Citizen Vince. It's kind of amusing to consider — perhaps even ironic — that politics and normal could be even remotely related. But anyway, don't worry — this isn't a political novel at all. Walter uses the days prior to the Reagan vs. Carter election in 1980 as the setting for his tale about a criminal named Vince, who may or may not be trying to go straight and lead that normal life. See, Vince is in the witness protection program in Spokane, Washington. He becomes fascinated with the way the two candidates discuss the Iran hostage situation, and realizes that now, even though he is a convicted felon, because he has a new identity, he can vote. But he's never considered politics and has no idea who to vote for. Things as "mundane" as who leads the free world had never been important to him before. But can Vince ever really leave "the life"? Indeed, as we first see Vince, waking up to go to his job as a donut maker (no, that's not a euphemism — he literally works in a donut shop) and trying to count how many dead people he's known, we already see that he's involved in a credit card scam; the same thing he was doing when he got busted back in New York and had to bail himself out by testifying against some nasty gangsters. When a hitman shows up in Spokane, Vince assumes that his past has collided with his present, and tries to figure out how to fix things so he won't have to constantly be looking over his shoulder. Walter is really sharp here — writing dialogue for gangsters and wise guys that you could drop right into movies like Good Fellas. John Gotti even makes an appearances here. And some of the side stories and minor details — like a guy who loses $2,000 on a football bet because his team misses an extra point — raise the "realness" of the novel as a whole; because, as we learned from Reservoir Dogs, which has nothing on Citizen Vince in terms of sharp dialogue, it's the details that sell a story, right? Walter's also is good at subtly poking fun at some of the absurdities of politics — like a guy who's running for the state assembly whose platform consists solely of revamping the city's zoo. Citizen Vince is Walter's third novel, and by most accounts, is the best of his early "crime" novels. This is the third Walter novel I've read (after The Zero, and The Financial Lives of the Poets), and I've really enjoyed all three of them — in very different ways. This is highly recommended if you're into the gritty crime novel. Or, if you just like really good writing.